K&N high flow replacement air filters for street vehicles are the perfect upgrade for performance. Not only are K&N air filters designed to add power and torque, but they also protect your engine through excellent filtration. K&N offers an amazing 1,000,000 Mile Limited Warranty® for these simple performance add-ons, which demonstrates the filter's durability to outlast the vehicle they are installed in and the confidence K&N has in their filters. 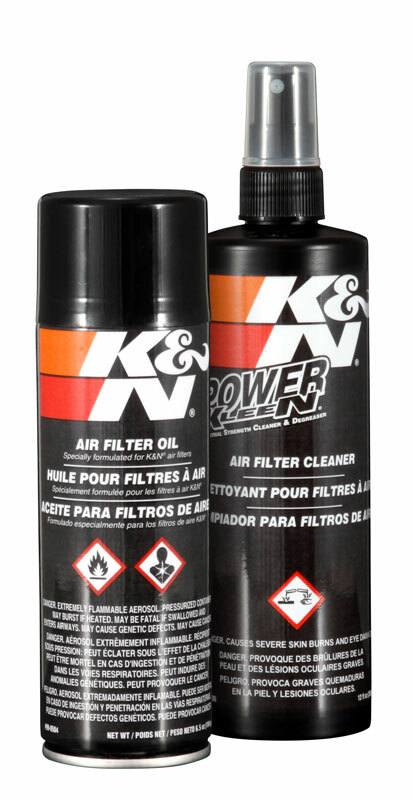 Your K&N air filter is a washable, reusable performance part that can be easily cleaned when the filter gets dirty. The filtration media was designed to capture dirt deep within the layers of cotton while allowing air to pass to the engine with very little restriction. Cleaning your cotton air filters are very important. Over time, dirt accumulates in the filter and airflow can be reduced. 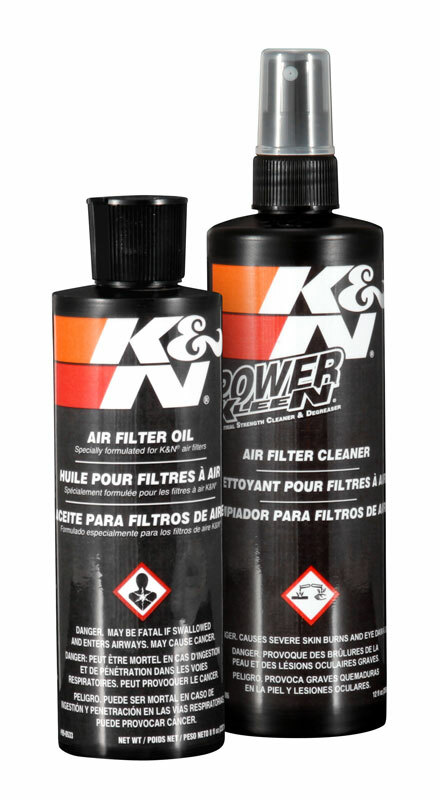 K&N offers simple and easy to use filter care service kits to recharge K&N cotton air filters back to a like new condition. These Recharger® air filter cleaning kits come in two different styles. Recharger kit 99-5000 comes with a 12 ounce bottle of Power Kleen cleaning solution and a 6.5 ounce can of aerosol spray oil. Recharger kit 99-5050 comes with a 12 ounce bottle of Power Kleen cleaning solution and an 8 ounce squeeze bottle of oil. Either can be used to service K&N cotton air filters. 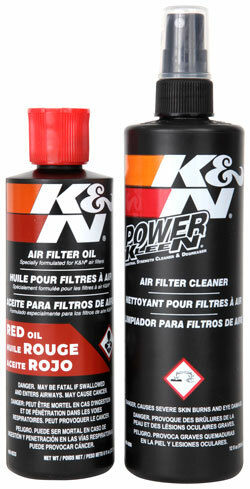 Both K&N Power Kleen and K&N air filter oil come in various sizes and they can be purchased separately. Popular as an air filter cleaner and as an industrial strength degreaser, K&N Power Kleen, comes in a handy 32 ounce spray bottle. Power Kleen is specially formulated to remove oil, lubricants, grease, grime, and other deposits from most surfaces including cotton air filters, painted surfaces, chrome, plastic and more. While many disposable paper air filters become clogged and need replacing nearly every year or so, K&N air filters for street vehicles can go for up to 50,000 miles before cleaning is needed depending on driving conditions. Once the dirt on the air filter either meets or exceeds the wire mesh surrounding the cotton fibers it's time to clean your filter. 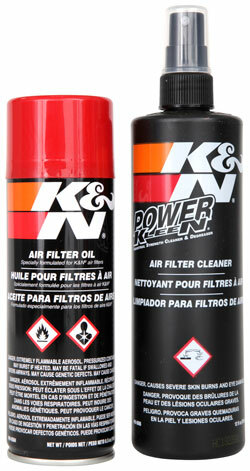 Visit the K&N Air Filter Cleaning Instructions page for full instructions to service your K&N air filter. This process is the only approved and recommended procedure for maintaining your K&N Air Filter. Find K&N products for your vehicle using the K&N application search then use the K&N dealer search to find a K&N dealer in your part of the world.